My name’s Alison Young, and I work in the School of Social and Political Sciences at the University of Melbourne, Australia. I research and teach about issues at the intersection of law, crime and culture. For some time now, that has included film, photography, art in the street and art in galleries. I’m simultaneously finishing a book on the spectatorship of violence in cinema, and writing another book which is on street art in cities such as Melbourne, New York, London, Amsterdam, Sao Paulo, Paris and Berlin. loving your blog. Nice one. Such an awesome idea! really enjoying the posts of late. i found you on the Everfresh site. Thanks so much for doing something meaningful. Thanks very much, Christen – much appreciated! Great site! been addicted to it for some time now. Just wondering if you could shoot me and email. I’d like to speak to you about a new Australian website launching soon. Hi Alison, like some of the comments before I also appreciate your posts. I appreciate your views and intelligent reflections. Will continue to read your blog! Great work! hi alison, what a great blog. would love to know when your book comes out too. I think you can set up an RSS feed to subscribe – some other folks have done that. Thanks for visiting and for your comments – good luck with your blog, it looks fantastic. i’m Dario Ujetto and i write a blog about Street Art too. If you want follow it the name is Madness Wall (www.madnesswall.com). I’ve added a link to your blog in the blogroll – nice work! Hi Alison… Great post on the Vandalog site. My name is George and I produce a street art magazine called VNA (Very Nearly Almost) here in London and we just featured Meggs on the cover of Issue 9. Drop me and email with your address and I will drop a copy in the post to you. Im interested in what you will think of it. Hi A, enjoyed your Vandalog posting. Have a look at http://www.twelvedoors.com. 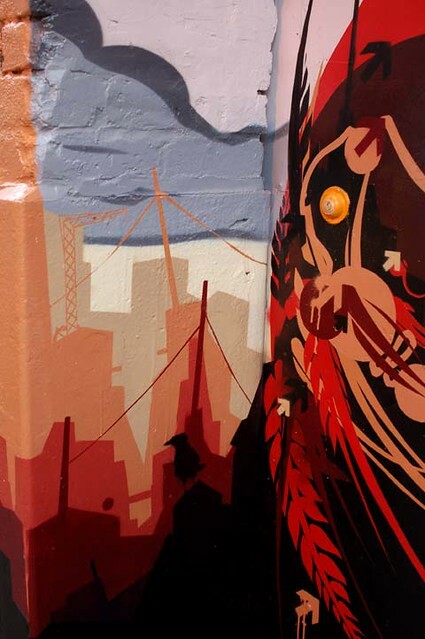 This is a street art project running in Dublin – 12 months, 12 different artists, 1 door. All work is transient with the next artist working the same door. Sorry for the delay in replying – thanks for letting me know about Twelve doors, I’ve added it to the blogroll now, what a fantastic idea for a street art project. I’m enjoying seeing how the year unfolds on this door. Thanks very much! Thanks for the copies of VNA – they arrived safely and I’ve really enjoyed reading them. Stay in touch! Excellent stuff here, i’d like to send you some images if possible, you have an email? Was just wondering if you might have an email I could send some information to about an upcoming Miso exhibition in Melbourne? Have sent you an email, Lauren! just thought i’d send along this link, case you’d find it interesting. last week I finished up a mural in the Downtown Eastside of Vancouver BC with local painter Jordan Bent, alley wall of a performing arts cooperative studio. The alley we were working in is going through some massive changes these days, lots of rapid economic development and loss of affordable creative space (the olympics just happened here last month and the whole city was trampled by the spectacle for the rich). crazy times in van city. glad to have a chance to throw up some relevant new work in the midst of the changes. Thanks for your insightful writing on the interestions between art, culture and contemporary society. Appreciate your contribution to the dialogue worldwide. I can’t find your contact details. I’d be very interested in your book on street art when it’s available. My primary obsession is world cinema, my secondary one is photography – especially urban decay and street art. I always have a camera on hand. Thanks for visiting the blog and for letting me know about this fantastic project. Stay in touch – look forwrad to hearing what you are working on next! Inspirational site! You seem to be doing the job I have always wanted…and very well I might add. Keep up the amazing work! Thanks for visiting the site – and for your supportive comments. Much appreciated! Hi Alison, saw you speak (discuss?) at the Exit Through The Gift Shop Q&A at ACMI on Sunday. Very inspirational. Are you on twitter? I just wanted to say how much I have enjoyed reading your intelligent, inspiring and informative blog. I am currently based in London but am in the process of trying to secure funding for my MFA at VCA next year. My proposed research largely revolves around the street art scene and it would be fantastic to be able to pick your brain if I make it across the sea! I photographed C215 at work in London over the weekend. You can see the images on my website at , if you would like to use them in any way, please get in touch and we can discuss further. Thanks, Sean! Great photos. Hope you enjoyed working with C215 🙂 Will be in touch if I need to, thanks for letting me know about your photos. In looking for the street artist PiTR I found your blog and this post. With your permission I will provide a link when I post my grafitti photos. Wonderful information and being in Paris from time to time searching for the street art is a treasure hunt. Every time I read this blog I’m consumed with envy for your lifestyle. Sorry about the envy thing… I do leave out all the mundane stuff that actually fills most of my time! Anyway, hope you enjoy reading it and hope you can keep visiting the site – thanks! i guess this site, of an italian artist, it’s very nice. hope to have found a good thing to u.
I tried to find an e-mail address to to send this to but failed so I will ask here. I live in Ipswich QLD. Each month a local gallery called “The Swich Comtemporary Art Space” holds an event called the “ARTALK Philosophy Cafe” where they get a local cafe to stay open on a thursday night and have discussions and debates about art and its place in society for example last months was “Architecture and Public Art”. A friend of mine named Wade and Myself have been invited to be the speakers at this months cafe with the topic being “Graffiti: Street Art or Street Crime”. We will mainly be focussing on street art in a talk and trying to show the difference between street art and graffiti to try and instigate discussion and debate amongst the people attending about whether or not they feel it has a place in society and if so what they feel that place is. It should be pretty good as it is a really good topic with people having strong views on both sides. As part of this we will putting together a slide presentation and I was wondering if it would be ok for me to use images from your blog as part of this slide presentation. I´ve just find this blog. Very interesting! Could you send me and email to hola@laplumaelectrik.org to send you our street art staff from Madrid, Spain! Thanks and keep on fighting! We are Pauer and Octavi two students from Barcelona. Right now we are doing an erasmus in Slovenia, in case you are mediterranean and you go on erasmus to the Balkans you do a lot of things but not study, so all the time we used to spend studying in the past now we spend it doing more creative stuff. We have done some projects but the last one we did, has made us think that maybe we are not a dumb and we can do something in life… We follow your blog and we want to know if our project are more or less like projects we admire and you publish in you site. Thank you for your time and we will wait for you answer! looks like we are crossing paths here and there!! i recently worked with Phoenix curating his first exhibition IN HERE OUT THERE, you must know his work…. and i run a little blog myself, all art photos, no words. lazy. Thanks so much for your kind words. Great to discover your blog, I have bookmarked it and will be checking it regularly. I’m familiar with Pheonix’s work but haven’t met him yet – hopefully one day! Great blog! You have a great perspective on the street art world. I have a street art blog that I’d like for you to check out and maybe include in the Images To Live By blogroll. The blog is http://frontlin.es and features photos from the front lines of the art world – street art. The blog is updated daily. Thank you for your consideration. I follow your website since long time, I like it very much 🙂 . i’d like to send you some images if possible, can your send me your email? I am writing to introduce you to my work. I am a artist with a focus on minimalist grafitti. Born in London based in Berlin. If this work captures your attention i would be very happy to keep you updated on my progress and development with this technique. maybe you should check street art scene in Athens as well..
There’s wonderful street art in so many cities now…. If you could provide an e-mail address to discuss archiving your web site that would be greatly appreciated. Many thanks for contacting Images to Live By regarding its possible archiving on Pandora. You are welcome to contact me at ayoung@unimelb.edu.au – I’m happy to discuss any issues you would like to raise in connection with ITLB and Pandora. I teach VCE art and am trying to frame a meaningful question for my students to discuss and debate for one of their assessment tasks. We are exploring some of the issues surrounding street art, and would really appreciate a pithy issue that they can use to develop and support an opinion on. They need to focus on the work of one artist, Miso and Ghostpatrol are favourites of mine, but want to give them some freedom to choose (they all use Banksy…but I want to extend them further, and would like them to look at Australian artists and issues). If you or any of your fellow bloggers have any ideas it would be greatly appreciated. Hi Alison, we, at Street Art Paris, really like your blog and would be interested in having you write a guest post for us on the Melbourne street art scene. Please send us an email to hello@streetartparis.org if it’s something that interests you. Have a great day! I’d be happy to talk further about this if you’d like – you are welcome to contact me through the University…. Thanks Alison, I had no luck with your uni email when I first wrote this comment in May. I have since come up with several issues for the students, and we are under way with some interesting discussions. Hi Glenda, that’s very odd – I didn’t receive any message from you via Uni email… we will need to check what address you used – I’m in transit right now but will email you from work when I get back next week…. We’ve been hibernating for a while trying to consolidate our photographic collection and thought you might like to see some of the fruits of our labour. At the moment we are focusing on collecting and displaying slogans on our facebook page, check em out. Loving the blog by the way. Particularly interesting for us to see the foreign scenes (being so Melbourne-centric ourselves). Loving the blog. Just wanted to get in touch about a couple of upcoming exhibitions that you might be interested in: The Young Masters Art Prize, 2012 & TEAM Atlas, by London based artist Lucas Price. Lucas Price will be exhibiting at Rove Gallery, Hoxton square, this December. A series of paintings depicting everyday objects, and monochrome passages of text, the show, “TEAM Atlas”, will be the first in Price’ Atlas project, and as such sets in motion a series of possible avenues of inquiry and points of departure. Paintings of photographs of sculptures. Lines from songs heard on the radio. Logos from the movies. A screwed “NBA” logo. Linton Kwesi Johnson. The middle of Nowhere, The Centre of Everywhere. Half a Haiku. Jesus Christ. Price started painting on the street as part of the graffiti crew BC, and then went on to study at RCA. He has recently been collaborating with renowned Japanese designer Kazuki Kuraishi on a clothes label, A.Four. The Young Masters Art Prize 2012 is a not-for-profit initiative featuring emerging and newly established artists who are inspired by the work of the Old Masters. Each artist references an element of the established through technique, imagery or subject, whilst establishing a contemporary spin on highly revered paintings. This is the second award since 2009, it is a bi-annual project created by American gallerist Cynthia Corbett. The award itself has some very exciting young artists including Derrick Santini and Christoph Steinmeyer. Sorry to inundate your comment page, but I wasn’t sure how else to contact you. Let me know what you think! (I did try the University email you posted above, but I’m not sure that it worked). Our focus is on helping artists to exhibit and market their work, by making it easy (and free) for them to sign up, giving them great tools to display their art and securely sell it. We’re trying to get the word out to artists! Hi Alison, I’m an undergraduate doing research on street art in Melbourne and I was wondering if I could ask you a couple of questions for my Fulbright proposal project regarding the city’s graffiti management program. Are you available by email? I just wanted to say also how much I enjoy reading your blog and that I’m happy to have found it! Are you going to be blogging again soon? My name is Verónica and I am a third year law school student from San Juan, Puerto Rico. Having read some of your articles pertaining to street art and art in general I do believe we share a similar passion for the arts while still having a legal mindset. As you probably know, Puerto Rico’s street art scene is currently at rapid growth and I have hopes of involving myself with this growth as I am trying to specialise in art law in the future. I am contacting you since I am currently writing a paper for my school’s Law Journal and thus I would love to have your input regarding this current growth of street art and the legal ramifications that follow it. I have not encountered that many studies regarding this topic, which is something that I did not expect…at times I do feel like am hitting a wall with my research. Is there any way I could contact you via email to ask you a few questions?